Cart@net is a simple tool designed to create and manage geoportals in accordance to the INSPIRE directive. The ISPRA SINAnet Multiserver WebGIS The WebGIS application for the Italian ISPRA (Environmental Protection Agency) that allows to browse data from different agencies and different servers in Italy, based on both different IMS technologies(ESRI, Hexagon/Intergraph, UNM Mapserver) and exchange protocols. 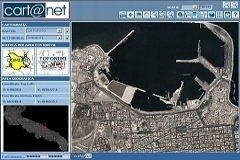 Atlante Italiano: maybe the first and most comprehensive Italian Geoportal ever published, owned by the Italian Ministry of the Environment, was developed at early year 2000 with Cart@net. It published the cartography of the whole Italian territory on the Web Color airphotos of Italy and geocoded maps of the Reference Geographic System.